The goal at the end of this independent study is to have created two distinct, custom WordPress themes that were developed with libraries in mind. For this theme, I want to create something with a small, public library in mind. I am somewhat basing my idea of the expected needs of such an institution on my project from last summer, where I worked on the re-design for a small public library’s website with two other grad students. We conducted a needs and analysis report based off of our interview with the client, and eventually created a mockup of a site for our client. My hope is to create something similar to this, but with the features of a WordPress theme that will make it all the more manageable (and suitable) for a small organization like this library. This week I finished up watching WordPress: Building Themes from Scratch Using Underscores on Lynda.com. I feel much more confident about my approach to creating a WordPress theme after going through this video course, and am looking forward to beginning work on my own themes in the upcoming weeks. I also took a look at Pro WordPress Theme Development, which covers a lot of similar topics as the Lynda.com video course. I appreciated the tips on theme testing and some further info on the review process once a theme has been submitted to the WordPress theme directory. I think this will be another source that may be useful to return to in the next few weeks if I have specific areas with questions/concerns. Switching gears a bit, I’ve been looking at some case studies and examples of libraries currently using WordPress as a CMS. 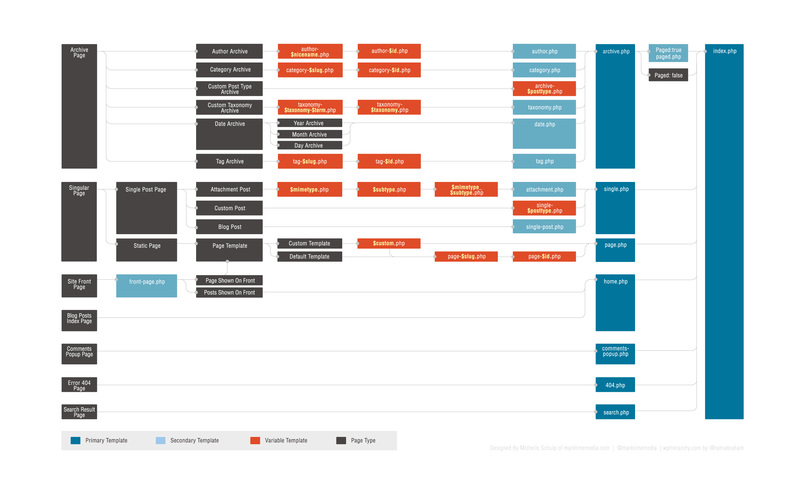 Morten Rand-Hendriksen (the author of the Lynda.com video) suggests creating a framework of your site based off of this template hierarchy, which I plan to do once I get further in the semester and begin the early design phases of my themes. This week I started studying PHP in detail. Although I’ve played around with creating some custom WordPress themes, and therefore have had a little experience with the PHP involved in constructing them, the resources from this week provided a valuable foundation for understanding what is really going on. I found both of these resources really helpful in different ways — and especially useful in conjunction with each other. I began with the Lynda.com videos, which provided a thorough but understandable introduction to PHP, including several exercise files that I was able to follow along with in order to replicate the examples the instructor of the course covered throughout the videos. This post was originally published as a reading reflection on the article Learn by Asking: The User Experience. The best libraries tailor their services to the needs of their communities. And while different communities have different needs, there certainly are similarities in communities across the country. What might some of these similarities be, and how can libraries use these similarities to their advantage? With this image of a library in mind, I think communities have several base qualities/interests in common when using the library. People are interested in information in a variety of forms, although the methods through which they prefer to seek out and receive information may vary. A “community” suggests to me a collection of individuals that share something in common — be that living in the same physical location or sharing a similar set of values/interests. Supporting communities and community learning therefore means looking past individual patrons and instead looking at how a community functions as a whole. This means facilitating an environment (through the programs, services, etc. offered/supported by a library) that is invested in the communication and cooperation of the patrons within our institutions — that communication being just as much between community members themselves as between community members and library staff. That all said, one of the biggest take-aways I got from this week’s readings was the importance of connecting with our users at as personal a level as possible. Aaron’s “Learn by Asking” article emphasizes this with his discussion on the necessity of cultivating empathy towards users: “if we want to make deep connections with our communities, we must figure out how people feel.” In order to make non-superficial connections and assessments of the communities we serve, it’s crucial to take as much interest in learning about the communities we work with as possible. User interviews paired with some of the other techniques we’ve been discussing this semester seem like a great way to work toward accomplishing this. Ultimately, when talking about a community, I think it’s important to remember that individual needs/desires interconnect in different ways. It’s probably not enough to find that User A uses the library one way and User B uses the library another. It’s where the motivations, interests, and interactions of Users A and B cross paths that true community evaluation can take place.